A decade has passed since Europe's first mission to Mars was launched from Baikonur cosmodrome on 2 June 2003. Aptly given the name Mars Express, it was developed more quickly, and at a much lower cost, than any similar missions developed up to that time. So successful was the design concept that a similar spacecraft, Venus Express, was later sent to the second planet from the Sun. The relatively low cost of the mission was achieved through new and innovative approaches in the working relationship between ESA, industry, national agencies and the scientific community, and through the reuse of equipment developed for ESA's Rosetta mission. Some of the scientific instruments also had a heritage from the unsuccessful Russian Mars 96 mission. With its complement of seven instruments, Mars Express was designed to study all aspects of the Red Planet, including its atmosphere and climate, and the mineralogy and geology of the surface and subsurface. It also carried a British-built lander, known as Beagle 2, which was released on 19 December 2003, six days before Mars Express braked into orbit around Mars. Since beginning science operations in 2004, the durable orbiter has given scientists an entirely new view of Earth’s intriguing neighbour. Perhaps the most high profile results have come from the high resolution camera, which has sent back thousands of dramatic, 3D views of the Martian surface, covering everything from immense volcanoes and steep-walled canyons to dry river valleys, ancient impact craters and ever-changing polar ice caps. Despite the planet’s current aridity, water has been a major focus of the investigations by Mars Express. One instrument has discovered hydrated minerals that form only in the presence of liquid water, providing confirmation that Mars was once much wetter than it is today, and demonstrating that conditions may – at least for a brief period - have been favourable for life to evolve. The first radar sounder ever to orbit another planet has detected subsurface layers of water ice. Another instrument has detected enough water ice in the polar caps to create a global ocean 11 m deep, and revealed vast plains of permafrost around the South Pole. Not surprisingly, the planet’s carbon-dioxide-rich atmosphere and low temperature results in the formation of carbon dioxide (CO2) clouds, as well as clouds made of water ice. Mars Express has detected these at altitudes of around 80 km. Even more remarkable was the discovery of a fleeting layer of clouds at altitudes of up to 100 km - the highest clouds ever seen above any planetary surface. In an endeavour to discover why the atmosphere is so thin and dry today, Mars Express has studied the upper atmosphere and ionosphere, detecting hydrogen and oxygen ions escaping into space. New insights into the structure of the ionosphere include the discovery of a new ‘meteoric’ layer created by fast-moving cosmic dust which burns up as it hits the atmosphere. During the most complete study of the atmosphere’s chemical composition, Mars Express has found indications of the possible presence of methane, which on Earth is attributed to active volcanism and biochemical processes. Even studies of the billion-year-old volcanoes have resulted in some surprises. Images suggest that some of them have been spewing out lava within the last few million years, while their flanks show evidence of being partially buried by glaciers in the not-too-distant past. Its highly elliptical orbit has enabled the spacecraft to look beyond Mars, in order to survey its two tiny moons, particularly the innermost satellite Phobos, which has been studied in unprecedented detail. The revised mass and density data open up the possibility that the interior of Phobos resembles a porous sponge. Perhaps the satellite was accreted from debris in Martian orbit, instead of being captured during a close encounter billions of years ago. 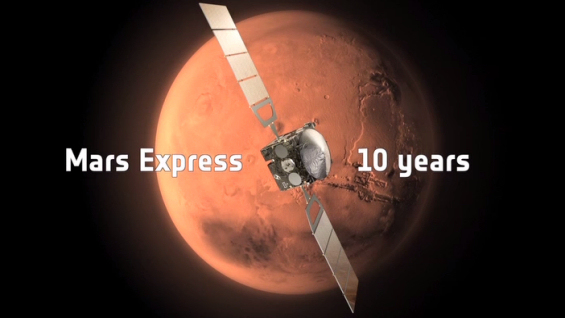 Mars Express has also been an invaluable member of the international effort to unravel the mysteries of Mars. During its lifetime it has acted as a communication relay between Earth and various NASA spacecraft, including the Phoenix lander and several rovers on the surface. The story of this remarkable mission has not yet reached its conclusion. As the mission continues into its second decade, more discoveries can be expected in the future. This legacy will prepare the way for future missions, including ESA’s next missions to the Red Planet: the ExoMars Trace Gas Orbiter, which is scheduled for launch in January 2016, and the ExoMars rover, which should follow in 2018.